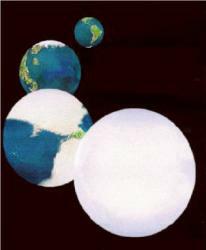 Snowball Earth - Universe Galaxies And Stars Section. Snowball Earth Probably Had Warm Spots. Snowball Earth. Image credit: NASA. Planetary geologists propose that our planet once had periods of extreme global freezing nicknamed the 'Snowball Earth' eras. During these periods, they supposed, the planet's temperatures went so low that the oceans froze, and everything was covered in ice. Most sunlight was reflected back into space, perpetuating the icy period. But new evidence disputes this. By analyzing glacial sedimentary rocks in Oman, researchers have discovered evidence of hot-cold cycles roughly 850-544 million years ago - during the period when the Earth should have been in a deep freeze. Instead of being completely frozen over, with solid oceans, it appears that the Earth still had warm spots with open oceans; places where geologic processes could happen. A global freeze would have been devastating to life. Without oceans there would be no evapouration and no weather system. Icy surfaces would have reflected much of the sunlight, keeping the Earth permanently cold. It appears that we got close, with the northern and southern icecaps nearly reaching one another. But we were fortunate to avoid that disaster. March 23rd, 2007: Enceladus. Image credit: NASA/JPL/SSI. You'd think it would be an easy question to answer: how long is Saturn's day? But it's been a puzzle for Astronomers for many years. On other gas planets, Astronomers just measure the rotation of their magnetic fields. The problem is that the Ringed Planet's field rotates slower than the rest of the planet, and it changes. 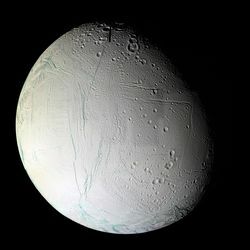 A new study proposes that Saturn's icy Moon Enceladus might be the culprit. Astronomers have recently discovered that the Moon ejects geysers of water ice into orbit around Saturn. These particles form a doughnut shaped ring around Saturn and become electrically charged. And this might weigh down the planet's magnetic field, slowing it down slightly. The length of Saturn's day has grown by 6 minutes from when NASA's Voyager spacecraft first arrived in the early 1980s to Cassini's arrival. It might be that Enceladus was less active during this period, so it was ejecting less particles to slow Saturn down. March 23rd, 2007: Orion nebula. Image credit: Gemini. This beautiful photograph shows a small portion of the star-forming Orion Nebula. 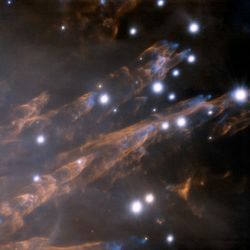 The strange, wake-like structures are supersonic 'bullets' of gas ejected from the nebula. What actually caused these ejections is still unknown, but Astronomers think there was a recent violent event that fired them out. Each one of these bullets of gas has a cloud of iron atoms at its tip, glowing bright blue in the image. This is followed by longer wakes of heated Hydrogen gas, which are coloured orange in the photo. The photograph was captured by the Gemini observatory's powerful adaptive optics system. This allows the observatory to compensate for atmospheric distortions that blur its view. 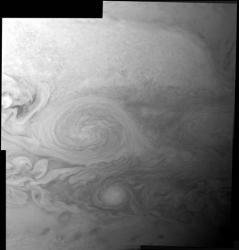 March 23rd, 2007: Jupiter's great spots. Image credit: NASA/JPL/JHUAPL. New Horizons captured this image of Jupiter as it zipped past on February 27, 2007 receiving a gravity assisted velocity boost. This photograph was captured when the spacecraft was 3 million km (1.8 million miles), resolving objects as large as 15 km (9 miles) across. The big storm in the middle of the photograph is Jupiter's Little Red Spot, which has been steadily growing in size and deepening in colour over the last few years. Another, even smaller storm is below and to the right. Scientists aren't sure why the spot turned red in colour, but they think that the storm has gotten so large that it's dredging up material from deeper down in the planet's atmosphere. March 23rd, 2007: impact crater here on Earth. Image credit: NASA. If you're planning a move in the next few years, you might want to consider thread from asteroid impact on your list of annoyances. Researchers from the University of Southampton have modeled the consequences of asteroid strikes around the Earth, and figured out which countries would suffer worst. For asteroids larger than 1km across, the consequences of an impact are global. But for smaller rocks, it all depends on whether it hits land or water. When an asteroid hits 200 metres across, a water impact would cause tsunamis across the oceans of the entire planet. Anything on the coasts would be affected. The team calculated how severely various countries would be affected by a water strike in terms of lives lost and economic damage. China, Indonesia, India, Japan and the United States face the greatest overall threats. 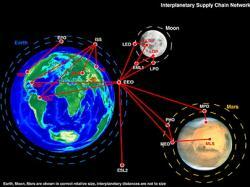 March 23rd, 2007: Interplanetary supply chain. Image credit: MIT. Once a permanent base is set up on the Moon, it's going to need lots of supplies shipped up from Earth. And these shipments, like water, food and air, absolutely, positively have to get there on time, or people die. A team of researchers from MIT have created a software tool called SpaceNet that models this interplanetary supply chain. It's based on a series of nodes in stable orbits around the Earth, Moon and Mars. These nodes act as supply depots or transfer points. As bases in space expand in population and complexity, the amount of material coming and going through these nodes would scale up. The researchers tested their models by spending a season at the NASA-sponsored Haughton-Mars Research Station in the Canadian arctic. They kept careful track of the supplies going in and out on flights to understand consumption rates. 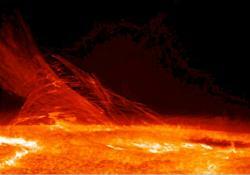 March 22nd, 2007: Swirling plasma on the Sun. Image credit: NASA/Hinode. NASA released some absolutely amazing new images of the surface of the Sun today, taken by the Japanese Hinode spacecraft. Just look at the attached image with this story, and you'll get a sense of why Astronomers think this spacecraft will do for solar astronomy what Hubble has done for the visual spectrum. For the first time, Astronomers are able to see how tiny granules of hot gas rise and fall, caught up in the Sun's magnetic atmosphere. They're able to watch how magnetic variations start out, and then spread across the surface. March 22nd, 2007: Jupiter as seen by Cassini. Image credit: NASA/JPL/SSI. It's not a great picture of Jupiter, but that's not the point. The point is that the photograph was taken by NASA's Cassini spacecraft, which is currently orbiting Saturn. When the picture was taken, Cassini was approximately 1.8 billion kilometers (1.1 billion miles) from Jupiter. At the time of the photograph, the distance from Saturn to Jupiter is roughly the same as the distance from the Earth to Saturn. A similar picture of Earth would only light up a single pixel in Cassini's camera. March 22nd, 2007: Falcon-1 on the launch pad. Credit:Chris Thompson/SpaceX. It wasn't a perfect launch, but it wasn't a disaster either. All in all, SpaceX took a big step on Wednesday with the first launch of its new Falcon-1 rocket. 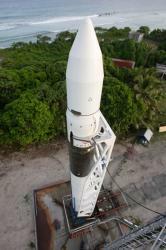 After several delays, the rocket blasted off from the Kwajalein Atoll launch facility in the South Pacific and rose to an altitude of 320km (200 miles). Unfortunately, the rocket didn't reach its maximum altitude because an unexpected roll caused an automatic engine shutoff. Falcon-1 is a two stage rocket running liquid oxygen and kerosene. The first stage is designed to be reusable, returning to Earth by parachute. SpaceX's primary goal is to undercut traditional launch expenses, offering flights as cheaply as $7 million. NASA and several other satellite manufacturers have scheduled flights with the new company founded by Paypal founder Elon Musk. March 20th, 2007: M93. Credit: NOAO/AURA/NSF. Monday, March 19 - Heads up for viewers in Alaska and Asia! There will be a partial solar eclipse visible in your area on this universal date. Be sure to check www.mreclipse.com for information in your area. It's great fun to watch the Moon take a 'bite' out of the Sun! And if the Moon is between the Earth and the Sun, you know what that means'New Moon! Tonight we'll start in northern Puppis and collect three more Herschel studies as we begin at Alpha Monoceros and drop about four fingerwidths southeast to 19 Puppis. NGC 2539 averages around 6th magnitude and is a great catch for binoculars as an elongated hazy patch with 19 Puppis on the south side. Telescopes will begin resolution on its 65 compressed members, as well as split 19 Puppis - a wide triple. Shift about 5 degrees southwest and you find NGC 2479 directly between two finderscope stars. At magnitude 9.6 it is telescopic only and will show as a smallish area of faint stars at low power. Head another degree or so southeast and you'll encounter NGC 2509 - a fairly large collection of around 40 stars that can be spotted in binoculars and small telescopes. Tuesday, March 20 - With the Moon still out of the picture, let's finish our study of the Herschel objects in Puppis. Only three remain, and we'll begin by dropping south-southeast of Rho and center the finder on a small collection of stars to locate NGC 2489. At magnitude 7, this bright collection is worthy of binoculars, but only the small patch of stars in the center is the cluster. Under aperture and magnification you'll find it to be a loose collection of around two dozen stars formed in interesting chains. The next are a north-south oriented pair around 4 degrees due east of NGC 2489. You'll find the northernmost - NGC 2571 - at the northeast corner of a small finderscope or binocular triangle of faint stars. At magnitude 7, it will show as a fairly bright hazy spot with a few stars beginning to resolve with around 30 mixed magnitude members revealed to aperture. Less than a degree south is NGC 2567. 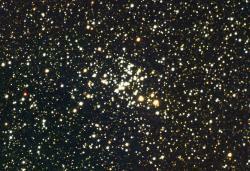 At around a half magnitude less in brightness, this rich open cluster has around 50 members to offer the larger telescope, which are arranged in loops and chains. Wednesday, March 21 - Today is Vernal Equinox, one of the two times of the year that day and night become equal in length. From this point forward, the days will become longer - and our astronomy nights shorter! To the ancients, this was a time a renewal and planting - led by the goddess Eostre. As legend has it, she saved a bird whose wings were frozen from the winter's cold, turning it into a hare which could also lay eggs. If you would like to see two goddesses tonight, be sure to watch the western horizon as the Sun sets for the super slender crescent of Selene being accompanied by brilliant Venus. What a way to usher in the northern spring! Take your Telescopes or binoculars out tonight to look just north of Xi Puppis for a celebration of starlight known as M93. Discovered in March of 1781 by Charles Messier, this bright open cluster is a rich concentration of various magnitudes that will simply explode in sprays of stellar fireworks in the eyepiece of a large telescope. Spanning 18 light-years of space and residing more than 3400 light-years away, it contains not only blue giants, but lovely golds as well. Jewels in the night. Thursday, March 22 - If you haven't had a chance to spot Mercury yet, be sure to have a look this evening just after the Sun sets. The swift inner planet has reached its greatest elongation for this apparition. Today in 1799 Friedrich Argelander was born. He was a compiler of star catalogues, studied variable stars and created the first international astronomical organization. Tonight let's have a look at an object from an alternative catalog that was written by Lacaille, and which is about two fingerwidths south of Eta Canis Majoris. Also known as Collinder 140, Lacaille's 1751 catalog II.2 'nebulous star cluster' is a real beauty for binoculars and very low power in telescopes. More than 50% larger than the Full Moon, it contains around 30 stars and may be as far as 1000 light-years away. When re-cataloged by Collinder in 1931, its age was determined to be around 22 million years. While Lacaille noted it as nebulous, he was using a 15mm aperture reflector, and it is doubtful that he was able to fully resolve this splendid object. For telescope users, be sure to look for easy double Dunlop 47 in the same field. When the Moon has set, enjoy a spring evening with two meteor showers. In the northern hemisphere, look for the Camelopardalids. They have no definite peak, and a screaming fall rate of only one per hour. While that's not much, at least they are the slowest meteors - entering our atmosphere at speeds of only 7 kilometers per second! Friday, March 23 - Today in 1840, the first photograph of the Moon was taken. The daguerreotype was exposed by American Astronomer and medical doctor J. W. Draper. Draper's fascination with chemical responses to light also led him to another first - a photo of the Orion Nebula. Before we chase the stars tonight, take the time to do a little lunar observing. Don't forget to look for crater Langrenus about midway along the Moon's crescent, and shallower and featureless Vendelinus south of it. Return to the Mare Crisium area and look for conspicuous crater Cleomides to its north. All three are lunar club challenges! Before the Moon commands the sky, let's have a look at an object that's better suited for southern declinations - NGC 2451. As both a Caldwell object (Collinder 161) and a southern skies binocular challenge, this 2.8 magnitude cluster was probably discovered by Hodierna. Consisting of about 40 stars, its age is believed to be around 36 million years. It is very close to us at a distance of only 850 light-years. Take the time to closely study this object - for it is believed that due to the thinness of the galactic disk in this region, we are seeing two clusters superimposed on each other. Tonight let's return to the Moon's wonderful surface and have a look at an ancient and ruined crater that lies on the southern shore of Mare Nectaris. To binoculars, it will look like a shallow, light colored ring, but a telescope will reveal that its northern wall is missing - perhaps melted away by the lava flow which formed the mare. 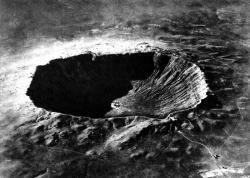 This is all that remains of a once grand crater which was more than 117 kilometers in diameter. The tallest of its eroded walls still stand at an impressive 1758 meters, placing them as high as the base elevation of Mt. Hood, yet in areas nothing more than a few ridges and low hills still stand to mark its remains. Power up and look for interior craterlets. Be sure to mark your lunar observing challenge notes with your observations! 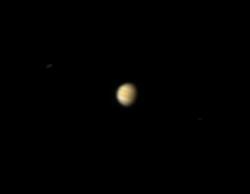 Sunday, March 25 - Today in 1655, Titan - Saturn's largest satellite - was discovered by Christian Huygens. He also discovered Saturn's ring system during this same year. 350 years later, the probe named for Huygens stunned the world as it reached Titan and sent back information on this distant world. Tonight we take on another lunar club challenge as we look mid-way along the terminator at the west shore of Mare Tranquillitatis for crater Julius Caesar. This is also a ruined crater, but it met its demise not through lava flow - but from a cataclysmic event. The crater is 88 kilometers long and 73 kilometers wide. Although its west wall still stands over 1200 meters high, look carefully at the east and south walls. At one time, something plowed its way across the lunar surface, breaking down Julius Caesar's walls and leaving them to stand no higher than 600 meters at the tallest. On this day in 1951, 21 cm wavelength radiation from atomic Hydrogen in the Milky Way was first detected. 1420 MHz H I studies continue to form the basis of a major part of modern radio astronomy. If you would like to have a look at a source of radio waves known as a pulsar, then aim your binoculars slightly more than a fistwidth east of bright Procyon. The first two bright stars you encounter will belong to the constellation of Hydrus and you will find pulsar CP0 834 just above the northernmost - Delta. Print Version - Original Article From Universe Galaxies And Stars.